I haven't had a chance to blog much, although I have plenty to blog about (isn't that always the way? I mean sometimes I have nothing to blog about, and I still post something). Anyway, this may be the one time I surface this week to post as I'm stressin' about taking the psych GRE this Saturday. First a strong Thank you to Lisa at BlogDogBlog who had a contest on her blog to caption a pic of her cute puppy! She sent out sock yarn to all people. 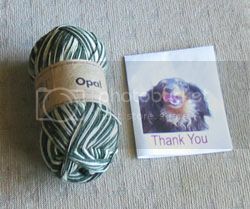 In fact, she sent me my first skein of Opal sock yarn!!! In an absolutely fab shade of green and beige!!! This is so wonderful, as I'm currently going ga ga over green fiber!!! Saturday evening ervy, fu, and I (or as minger like to put it ELOFU) went up to Spices in the city. It was so yummy! This was the first time we went to the second spices (about two blocks from the first spices), and we found the food to be as good, but presented much better. We also had a nice spacious table (the other spices packs ya in like a can of sardines!). Top Left: A book on bookbinding. I really like making my own journals and binding things together for photo presentations, but after having such a tough experience finding a good set of instructions for coptic stitch binding, I thought having this in my reference library might be nice. Lower Right: Simple Knits with a Twist. I've eyed this book before, but I never really thought it was much more than very pretty photography. At used book prices though, I figured I would give it a shot. I'm not sure yet whether there is anything in here I'd knit, but we'll see. Afterwards we visited Ming's city apartment for the first time, and we met his new kitty Beckett (pics avail on his blog here). 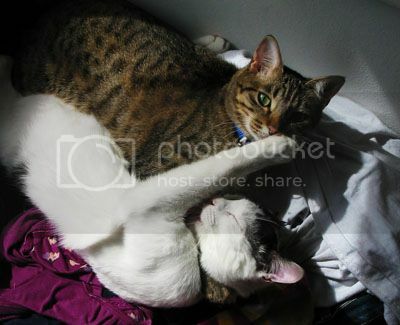 Beckett was a cutie and a lover, although he was much much LARGER than any of the other kitties I know! 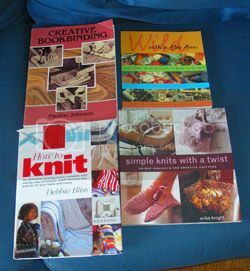 Speaking of books and DIY craftiness. I was reading through my blogs last week, and someone was talking about these two mags: Budget Living and ReadyMade. I hadn't really looked at either before, so I picked them up at Kepler's on Friday (after satisfying a MAJOR fish and chips need at the British Banker's Club). I REALLY like these mags. ReadyMade is awesome. Very DIY for eco-friendly purposes. They have these neat challenges to their readers to be crafty with things like wood shipping pallets or those heavy duty milk crates! Budget Living is fairly nice too. 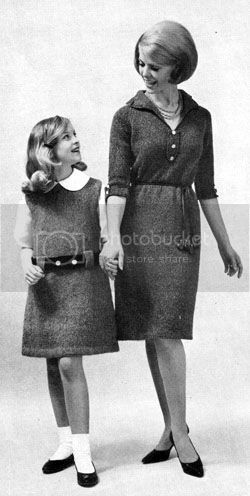 I could skip on the fashion stuff, but they also hold up crafting in high regard. They have a small diy section, and they even interviewed the creator of Craftster.org (a favorite stomping ground of mine). They do point out some neat deals or finds for your house as well which could always be handy. They've been behaving pretty well. They've started using each other's litterboxes... just cause. I guess they think the grass is greener on the other side. Nikko still wakes up and starts whining for something at 7am. We don't know what he wants.... when will he start to sleep LATER?!! Tea lovers should check out Numi Organic Teas. (Again, I saw this on someone's blog last night, but I can't for the life of me remember which one :( ).They're actually based locally (in Oakland), but they make the most BEAUTIFUL teas ever! They handsew the tea leaves so that when the tea is brewed, they open up into beautiful flower shapes! Obviously this is only good if you have some sort of clear brewing contraption like a museum tea pot or ingenuitea (from adagio.com). The prices are a bit prohibitive for me right now, but it's certainly a neat discovery! I was wondering where you've been! But you might want to check your dashboard. This happened to me yesterday too. You double-posted this one. I am an absolute devoted fan of Asha ... and of course I love Nikko too. They are soooo adorable together. Oh my god! 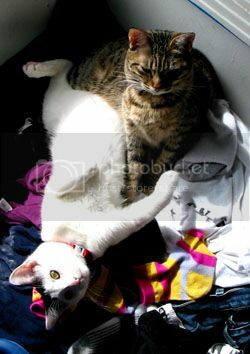 Those kitty pictures are adorable! Interesting about the Numi tea. I drink the stuff in bags pretty frequently, but now I am going to have to try the flowering tea. Oh, I see another obsession coming..!